The above info came from Richard Beer, and was edited by yours truly (contact me). The image came from Amazon.com. The OVA anime series of Psychic Force is an adaptation of the original arcade/Console game that was released in 1996 Japan/US and 1997 Europe. A group of people who possess supernatural powers have begun to spring up all over the world. 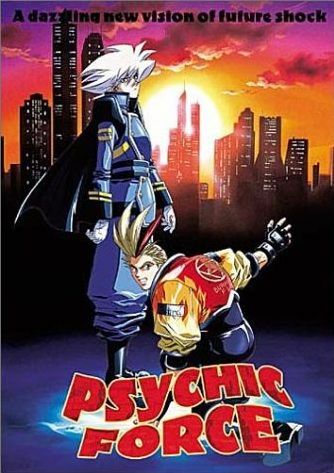 These individuals became known as so called "Psychicers", who possess powers such as the ability to manipulate fire or wind or ice. However the humans who currently inhabit the world who do not possess such power seek to eradicate and oppress such individuals, with some governments even seeking to use them as weapons or even artificially produce them! The basic rundown of the story is that all the Psychicers all over the world are brought together by a self deemed leader of the psychicers known as Keith Evans. Keith and another individual called Richard Wong set up an organisation called Noah, the aim of Noah is to form a new world in which Psychicers can live in without the oppression of humans. This leads to the psychicers fighting against the humans and eventually gaining an advantage. At first Keith simply has a vision of a perfect world for the psychicers, but the influence of Wong, and his own hate for humanity due to the torture and experiments performed on him by humans, his dream quickly turns into a twisted vision in which Keith wishes to totally wipe out all of humanity until only Psychicers are left. The only set back to Keith's plans, lays in the form of his best friend Burn Griffith, who upon learning of Keith's plans and what Keith wishes to use him for, rejects Keith's vision and acts against him. But can Burn stop Keith from exploiting his fellow psychicers and the potential destruction of mankind. The basic plot of the series for the most part does run parallel with the storyline of the game, although there are a few minor differences in character backgrounds. All in all, the anime may come as a disappointment to the people who have played the game prior to watching the anime, due to its shortness in length and lack of detail. The ending also leaves a few questions unanswered. The above description came from Richard Beer, and was edited by yours truly (contact me).